Phone calls from League Two managers have already been logged. Now Wes Fogden is taking time to agonise over his next footballing home following his Fratton Park exit. 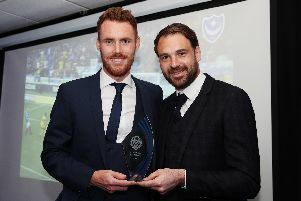 The 27-year-old was a surprise name on Paul Cook’s list when he departed Pompey on Monday alongside eight of his team-mates. With the club having opted not to take up the option of a contract extension, Fogden’s one-and-a-half year spell came to an end. Now the midfielder is looking forwards as he seeks to resolve his future. And he is encouraged by football’s response in the subsequent days since Cook’s bombshell. He said: ‘I am not really sure what I will be doing next to be honest, I have left it with my agent. ‘I’ve had a couple of calls from a few different managers and am just weighing up other options and enjoying the off-season, spending time with my family. ‘I am sure once I come back I will try to make the right decision. ‘I’ve had a couple of League Two managers call up. I am not going to say which ones out of respect for them, but I have options at the moment even it’s in the early stages of where I decide I want to go next season. ‘There have been a few different calls but it is still early doors, the play-offs aren’t over yet so managers are focused on them. ‘The knee is fine as well. When the season finished I carried on training in the gym and taking part in running sessions so I am going into pre-season fit and sharp to make the best out of next season. In July 2014, Fogden sustained cruciate knee ligament damage while training with the Blues. He returned to became a part of Andy Awford’s squad once more, making three successive starts before the manager’s April exit. However, much to the former Bournemouth player’s frustration, under caretaker boss Gary Waddock he would make only two substitute appearances, including unused on the bench in the final two fixtures. He added: ‘Gary (Waddock) came in and basically told me that after the knee injury he was looking out for me and leaving me out. ‘I didn’t really see it that way personally because I felt I needed as many games as I could to build my fitness back up and my knee was back to normal and 100 per cent. So I thought him coming in and doing that wasn’t really justified. ‘But the manager has got to do what he has got to do and has a whole squad of players to look after and I am not the only one. ‘I had to deal with that and see the season out.